We get asked a lot about answers for our Mastery Exams, so we thought we'd share some insights with you. Unlike our course assessments, the Mastery Exams from The Call Center School don't provide feedback regarding correct or incorrect answers on completion. This is intentional functionality. The Mastery Exam's key purpose is to test the skills and knowledge that you learned during training, and to therefore certify your expertise. Learners who do not pass the exam will be presented with the modules they need to review. Specifically, the modules related to incorrectly answered questions and/or unanswered questions will be presented in a handy overview. 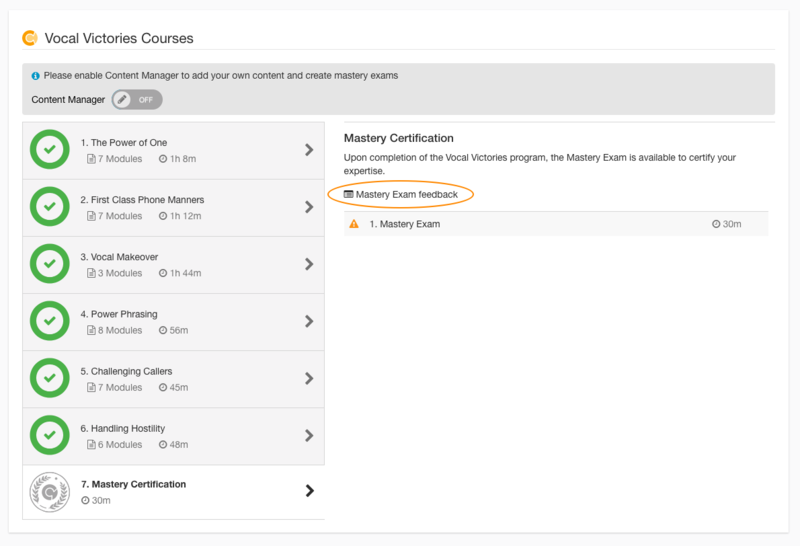 You can find this overview in the Mastery Certification Course in the Program. Note: this feature is also available for custom exams. You can take any Mastery Exam as often as you like until you pass - there's no limit on the number of attempts. The pass mark is 80% or higher to become certified.